gbWebCamLite consists of a single window from which all features may be accessed. The main window displays a preview of the webcam, the most recently captured image, caption settings and various other settings. The common functions beneath the video preview window are Start, Stop, Reset, Countdown Timer, Capture, and status listbox. Note: the Start/Stop function is supplied by the same button. Its label changes to reflect the function it will perform. 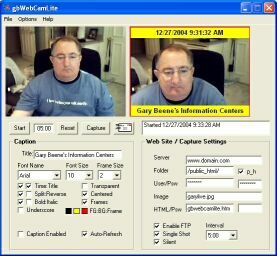 gbWebCamLite can upload images to the server in two ways - automatically at the end of a timed interval, or immediately by pressing the Capture button. gbWebCamLite provides File, Options, and Help menu selections. Open an email for sending the image. The last captured image is automatically sent to the clipboard and must be manually added to the new email that is created. Opens dialog window that allows selection of the size of the image that will be transferred. gbWebCamLite will display images up to 320x240 only, but will correctly transfer larger image to the server. Displays a web page with the most recently captured image, with captions as set by the user. The file displayed resides on the users PC. Displays a web page with the most recently captured image, with captions as set by the user. The file displayed resides on the users server. Calls up the user's default email software with a message addressed to the author of gbWebCamLite. Opens the default browser at the gbWebCamLite Online Help page. Opens a dialog window from which the latest version of gbWebCamLite can be downloaded. User-defined text caption to be placed on the image when it is transferred. The time caption is automatically generated. Dropdown selection of the border size. The border will be contained within the image dimensions. Frame thickness of 2-20 pixels are supported. By default the time is printed above the title, both at the top of the page. The split option places the time at the top of the image and the title at the bottom of the page. The reverse setting exchanges position of the time and title captions. When checked, automatically presses the 'Capture' command whenever a capture setting is changed. Note: I suggest that you disable FTP while adjusting the caption settings, then enable it once you're happy with the settings. Opens color dialog window to select colors for foreground (text color), background (color behind the text) and the frame. The colored background is only displayed if the Transparent setting is not checked. The folder on the server to which the image will be transferred. The local files is always named "gbfreecam.jpg". It is renamed during the transfer to the server. Some servers do not allow a URL to contain "public_html" where this is the root directory for a user. Selecting this will cause gbWebCamLite to delete the "public_html" from the URL used to view the HTML pages. File name of the image, on the user's PC and on the server. Name of HTML file to be placed on the local PC and the remote server for viewing the most recently transferred image. The HTML page generated for viewing archive images is named "archive_" plus the remote file name. If an entry is made for the password, a visitor to the page must enter the password to be able to view the page. Note: This is a weak security measure. It will keep out the typical visitor but there are methods around this approach. Enables FTP transfer of the file to the server, but allows all other operations to function. Use this to preview the effects of caption and border settings before committing to a transfer of the images to the server. Dropdown selection of pre-specified intervals, ranging from 5 seconds to 60 minutes. The time may also entered manually in two ways, through the countdown text box (next to the Start button) or in the Custom textbox. Only the value entered in the Custom textbox will be kept for the next session. Time may be entered as seconds or in a mm:ss format. gbWebCamLite will convert all entries to the mm:ss format.